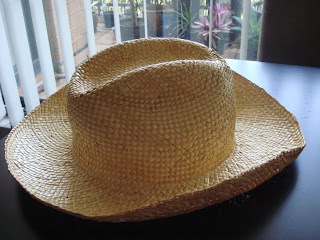 The hat before I started – it was a cheap nasty one from Target. We’re just going to use the top of the hat and discard the brim. 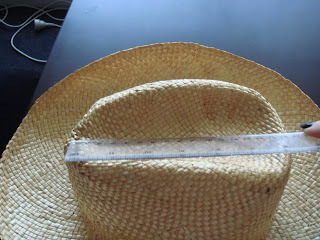 a hat, ruler and pencil, scissors, grosgrain ribbon, paint and glue. 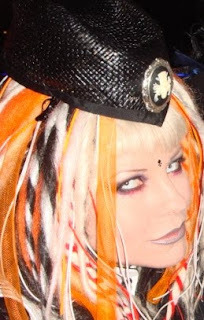 Optional extras: hat elastic, brooch or other embellishment to decorate the hat. Decide how deep you want the cap (that is, how high it’s going to sit on your head). 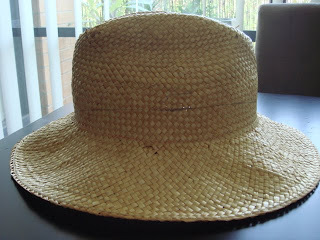 The hat from the side. See it’s a slightly diagonal line. 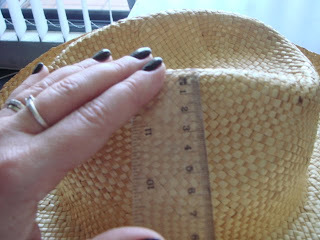 You may want to mark a couple of different lines, if you’re not sure what depth you want the hat to be. Step 3. Now it’s time to cut it with some sharp scissors. If in doubt, make it higher than you think you may need it, put it on your head to see what it looks like, and cut more away if need be. 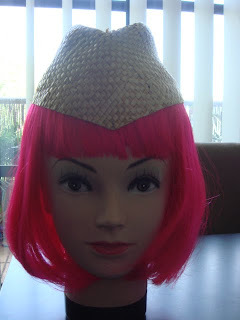 If you have a dummy head, or a willing friend to model it, put the cap on to see if it’s the height you want it. I didn’t like the ‘pinches’ either side of the crown, as they are just too cowboy for my taste, so I decided to get rid of them by steaming the cap. This isn’t too scary, and doesn’t require special equipment, trust me! Step 4. Bring a pot of water to the boil, preferably with a lid with a small steam hole in it. 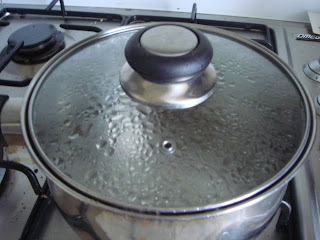 Otherwise, just put the lid on the pot at a bit of an angle, so some steam can escape from the side. Step 5. 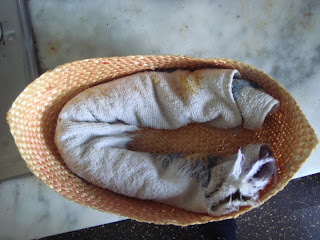 Roll a small towel into a sausage shape and place inside the cap. 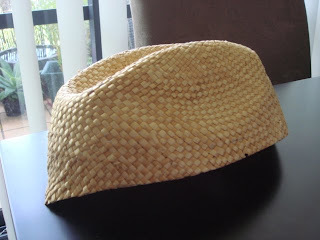 This is to keep the shape of the cap. The steam is going to get rid of the pinches. Step 6. 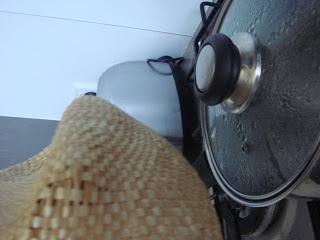 Bring the cap to the steam hole in the saucepan lid, keeping your hand away from the hole. Ok, maybe this is a little scary. Make sure you don’t burn yourself. Steam until the indents are sufficiently lessened, and put the cap somewhere sunny to dry (as it will be a little moist from the steam). Leave the towel in while the cap dries. Step 7. 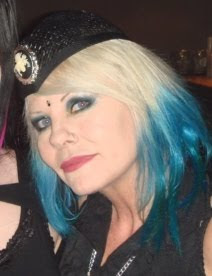 I sprayed my hat with black paint – you may want another colour. Either take it out somewhere airy like a balcony to spray it with paint, or you could brush the paint on. I found enamel paint in a spray can adhered better to the straw. Ordinary school paints may just be absorbed. Again, allow to dry. Now to finish off that nasty raw edge! Step 8. 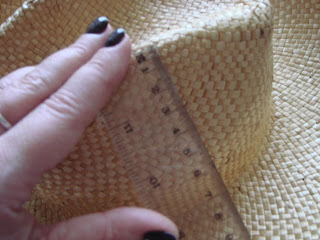 Measure round the edge of the cap, and cut a piece of grosgrain ribbon slightly longer. We’re going to glue it around the edge, with half the width of the ribbon either side. I folded the ribbon over first and creased it with my fingers, to help me keep it even as I glued. Step 9. 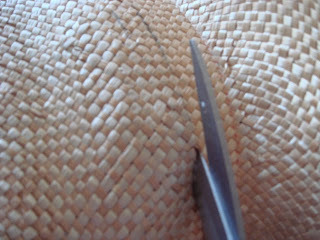 Glue the ribbon round the edge of the cap – don’t use too much or it will get messy, and spoil the finish. You could sew it instead of gluing – but that’s a lot of work! Step 10. 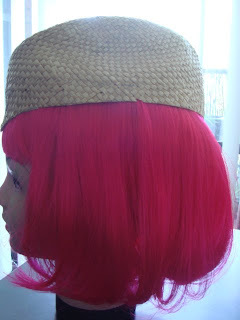 The cap may just sit fine by itself, but if you want to make sure it stays on your head, you could attach some hat elastic. 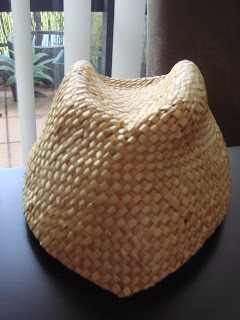 Measure yourself ear to ear, cut the elastic, thread the elastic through the basketweave of the straw either side of the cap, and knot it on the inside. Step 11. 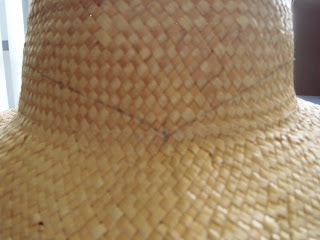 If you want to further embellish the hat as I did, grab a brooch or similar and pin through the hat. I bought the skull cameo and metal backing from ebay and glued them together myself. The beauty of brooches is that you can change them to go with different outfits. The military/geek look in action. Only just saw your comment Valerie – thank you so much!! wow, amazing. I love DIY project. Thank’s for the tips 🙂 Love your blog too.